Diamonds have been a thing of the royal and noble people before the discovery of South African diamond mines. They collect them because of their beauty and rarity. One of these royal diamonds is the Beau Sancy diamond which has been recently sold at an auction in Geneva. The 35-carat modified pear double rose cut gemstone was once reputed to have belonged to the Mughals of antiquity, but is more likely of Indian origin owing to its cut which is unusual by Western standards. It was first recorded in history in 1570 when it was purchased in Constantinople by diplomat, financier and jewel expert Nicolas de Harlay, Lord of Sancy. It was then purchased by French King Henri IV upon insistence of his wife, Marie de Médicis. “She wanted that stone as soon as she knew that Nicolas de Harlay had sold Le Grand Sancy to the King of England, James I, for his wife,” a Sotheby’s spokesperson told Le Parisien newspaper. It is said that this diamond did not bring great pleasure to the both of them since just a day after the coronation of Marie de Médicis, for which the large pear-shaped gem was set atop her crown – Henri was assassinated, leaving her with six children under the age of nine. It has since passed among the royal families of France, England, the Dutch Republic and Prussia to show off their wealth and to pay their debts as well. In 1631, because of rivalry between Marie and her son King Louis XIII, the now Queen Mother of France fled to Brussels and then to Amsterdam. From there, to settle her debts, she sold Le Beau Sancy to the Dutch royal family where it was used to seal the wedding of William II of Orange to Mary Stuart, daughter of King Charles I. When William died, Stuart returned to England and pawned the jewel to fund her brother Charles II’s fight for the throne. It returned to royal ownership when her son William III of Orange-Nassau married Mary II with whom he jointly ruled England until her death in 1694. When he died without heirs Le Beau Sancy was returned to the Dutch family and then to the first Prussian Kaiser, Frederik I, in 1701. It has passed down through generations of the House of Prussia. Today, the 34.98 carat jewel has been sold to an anonymous bidder at Sotheby’s in Geneva, Switzerland for 9,042,500 Swiss francs including the buyer’s premium – more than double the $US2-$US4 million estimate. 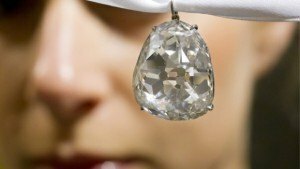 David Bennett, co-chairman of Sotheby’s Switzerland, said before the sale “We’ve sold much larger diamonds but it has this wonderful romantic history, an unparalleled royal history – it has never been in non-royal hands.” However, since the buyer has been anonymous, no one knows whether the historic jewel fell to the hands of a royalty or a commoner.